In recent weeks, I’ve been stirred to do a word study on the making of new wine and the wine of the wrath of God as portrayed throughout the Holy Bible. Since the word ‘wine’ is used more than 200 times in scripture, no doubt it was a subject important to the Biblical Patriarchs. In some religious circles there is much discussion if wine in Biblical days was fermented or just ordinary grape juice. Surely we are instructed not to become intoxicated with strong drink but with the many other teaching resources available on this subject, it is not the author’s intent to discuss whether or not it is appropriate for a Christian to drink wine. This article will focus on the spiritual aspect of ‘new wine’ as revealed in the Holy Scriptures. Since the turning of water into wine at a wedding was the first miracle of Jesus Christ, it is important for us to learn from the Master winemaker himself. (John 2:2-11) While we do not know if the water in the pots was pure or polluted, John’s gospel indicates that Jesus took very ordinary water and changed it into the very best wine. Jesus later spoke of the promise of the Holy Spirit, “He who believes in Me, as the scripture has said, out of his heart will flow rivers of living water.” (John 7:38) Christ’s promise to all who believe in him is they too will have rivers of living water flowing through their hearts and spirits. Could it be the LORD is trying to show us how we too, can turn His living waters into New Wine! 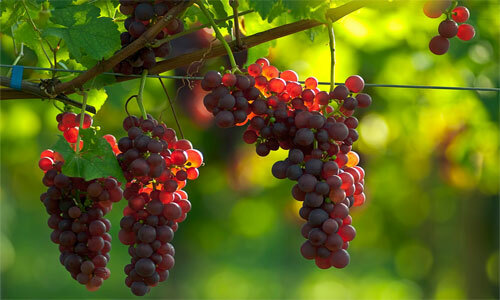 Jesus identified himself as the vine, the source from which grapes grown, and when they are ripe, can be picked to produce new wine. “I am the vine, you are the branches. If a man remains in me and I in him, he will bear much fruit; apart from me you can do nothing.” (John 15:5). This three year cycle is specifically significant when one considers Jesus earthly ministry was only for three years before he began his heavenly ministry. There are other Biblical stories which indicate there was a three year time lapse before God moved his people into a different phase, i.e., Elijah and the drought; three years without war between Aram and Israel; Isaiah went barefoot and naked for three years as a sign. Could it be that if WE, as the Body of Christ are going to continuously have fresh new wine flowing through our spiritual beings, than we must realize that wine-making is a constant process. We must be willing to allow the Holy Spirit to change us, or after a three-year cycle we will become religious and the new wine insipid. It was denied to the Israelites in the wilderness, that they might know the LORD was their God (Deut 26:6). It was forbidden to Priests while on duty (Lev 10:9) and to the Nazarites (Num 6:2,3). In the temple service, the pouring out of wine of the drink offering at the morning and evening sacrifice was the signal for the Priests and Levites to begin their song of praise to God. Watchmen were stationed in a tower to watch over the vineyards. Abundance of wine was a special token of blessing (Gen 27:28) and extraordinary abundance would be a token of the Messianic age. The ground soil chosen to grow vineyards is the first and most important decision in the wine-making process. Jesus taught his disciples that the Word of God is the seed and man’s heart determines the condition of the soil. This great holiday season and the joy of vintage is to be carried over in our spiritual lives to the end of the ages. The prophet Zechariah foresaw the day when the Feast of Tabernacles would become the most important Feast of the nations. Even today there are a great number of believers in Jesus Christ who understand the significance of this prophecy and take the annual fall trek to Jerusalem to celebrate the Feast of Tabernacles week long celebrations with their Jewish brethren. A few years ago I was blessed to visit Jerusalem during the fall feasts. I must say, there is nothing quite like the spiritual joy one experiences when acknowledging and celebrating the great feast of the Lord in the city of our God. remain during the first fermentation. A press vat might also be made from wood and wooden beams were often used to finish the pressing. Winemakers understand the less pressure on the grapes the better the product. The juice which flows from the weight of the grapes piled in the winepress is kept separate from the liquid obtained only under heavy pressure. This process gives us great understanding in the differences of the ‘new wine’ which is produced by the fruit of the spirit (Gal 5:22-24) vs. the pressures from religious activity and works of the flesh. In Israel’s hot climate, fermentation begins almost immediately after the juice has been pressed out. First a slight foam appears on the surface and then the action becomes more violent. During the fermentation process, the liquid must be kept in jars or a vat, for it can burst even the newest and strongest of wineskins. About a week after first fermentation, liquid was transferred to other jars or strong wineskins to undergo a secondary fermentation. At the bottom, the heavier matter or ‘lees’ was collected. While certain kinds of grapes were left undisturbed to age on their lees and were thought to be all the better for doing so, they had to be carefully strained for storage or transport. Now, this concept of the fermentation and lees is really the background to another truth the Holy Spirit has unfolded. Jeremiah 48 speaks about the judgments coming against Moab for his pride and arrogance. The Moabites were descendants of Lot from his sexual relationship with his daughter. Rather than protect his daughter and find her a proper husband, Lot took advantage of his own flesh. Today we can look at those having a Moabite spirit as one likened to a haughty incestuous spirit, caring only for their own desires and not acting as a proper Father to their offspring. But it was an earlier scripture which really caught my attention, and while the translation may be different in various Bible versions, the concept is that of the straining of wine from one vessel to another, to remove the sediment/lees. “Moab has been at ease from his youth; He has settled on his dregs (lees) And has not been emptied from vessel to vessel, Nor has he gone into captivity. Therefore his taste remained in him, And his scent has not changed. It is the Wine-workers who the LORD will use to tip over the Moabite spirit. The Lord wants to instruct us how to become wine-makers so that in return, we can teach others who are in our midst, to make ‘new wine.’ Every follower of Christ has their own assignment in the making of his ‘new wine.’ Some might act as watchmen in a tower overseeing the vineyards. Some will be picking the grapes, some trampling in the winepress, and others helping to make the new wineskins. Whatever ‘place’ the LORD may have you positioned to work, consciously allow His living water to flow through your innermost being. Be attached to Jesus and you will produce good fruit which when crushed, produces the fruit of the vine. Let the LORD Jesus Christ include you in His miracle of changing water into new wine! Captivating Creative Craftsmen & Study Guide, is filled with inspirational stories behind Biblical artisans and is the latest book from our Open the Word contributor, Myrna Petersen. With references to the Bible, it begins with story telling and gives prophetic understanding of how in the last days, the beauty and glory of the LORD will permeate the world, demonstrated through science and the arts. As we draw closer to the Creator of the universe, we’ll be inspired to create new works. Creativity, part of our inheritance, from the cave dwelling era to modern society is revealed through various artistic means. It is not just the job of a few artistic types but the expectant hope of every man, woman, and child in the universe. For a sneak preview and/or place an order of paperback copies @ $10.00 CDN plus taxes & delivery, from our distributor. Download E-pub for various e-book formats @ $3.99 US. Myrna Petersen is a writer and musician based in Regina, Canada and owner of Ideation Entertainment. She loves to uncover obscure historical gems and present these stories in the language of the common man. Myrna is the author of five non-fiction books, a stage musical and several film scripts. Check here for some of her other writings. Previous PostWhat was on those parchments?